You can use the Asset Manager or command line interface (CLI) to upload datasets in the Shapefile format. (See Importing Raster Data for details on importing rasters using the Code Editor or CLI.) Your uploaded assets are initially private, but can be shared as described in the Sharing Assets Section. Give the table an appropriate asset ID (which doesn't already exist) in your user folder. Click OK to start the upload. Figure 1. 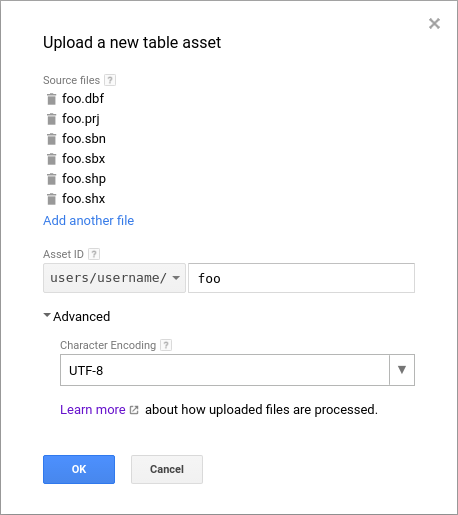 The asset manager table upload dialog. Note that the .shp, .dbf, and .shx files are required. The other sidecar files are optional. If the .prj file is not provided, WGS84 is assumed. Once you have started the upload, an 'Asset ingestion' task appears on the Tasks tab at the right side of the Code Editor. Hovering over the task in the task manager shows a ? icon which you can use to check the upload status. To cancel an upload, click on the spinning icon next to the task. Once the ingestion is complete, the asset will appear in your user folder with a table_chart icon. To create a FeatureCollection in your script from a table asset, import it as described on the Managing Assets page. You can also use table data stored in Google Fusion Tables in Earth Engine. Log into to your Earth Engine account then create a Fusion Table. (Learn more about Fusion Tables at this link). In the ‘Import new table dialog’, click Choose File and navigate to table data (which may or may not contain a geometry column) stored in a file on your computer. For simple geometries (e.g. points), a two-column location in tabular data can be used. (Note: two-column locations are not supported in the Earth Engine Explorer interface). For complex geometries, KML is usually preferrable. Click Next and inspect the table preview. If the data are correctly imported, click Next again, fill in the relevant metadata fields, then click Finish. The imported Fusion Table will be created in your Google Drive account and you will be taken to the Fusion Table page. Go to the File menu and select About this table. In the ‘About this table’ dialog, find the Id and copy it into the Earth Engine FeatureCollection constructor. Alternatively, the website shpescape.com can create a Fusion Table directly from a Shapefile. // Load a Fusion Table from the ID using the FeatureCollection constructor. Note that everything after the ft: is the ID from the ‘About this table’ dialog. (Alternatively, find the ID in the URL of the table). For others to be able to use a Fusion Table you created (e.g. when you email your script link to collaborators), click the Share button in the Fusion Tables interface, then set the access level such that it is shared with whoever you want to have access. See the Fusion Tables page for more information.